#Use your existing Nokia, Sony Ericsson or Motorola mobile phone! 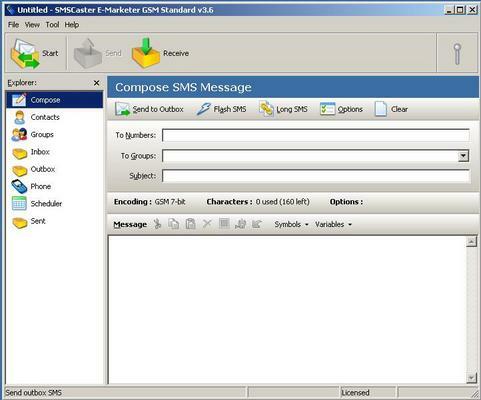 SMSCaster E-Marketer is easy-to-use yet powerful SMS message broadcasting software for e-marketing. It allows you to send marketing & advertising SMS and receive response SMS from the computer. f differs from other desktop texting software which relies on an Internet SMS gateway. Instead, use your existing mobile phone, GSM modem or cellular terminal and connect it to the computer. The connection can be done via a USB data cable, serial data cable or Bluetooth COM port. Designed with bulk broadcasting in mind, SMSCaster helps you manage your marketing campaigns and send customized messages to your target groups. Since SMS is fast and cost effectiveness, messages like promotion, reminder, alert, special notice or statement are well suited to be delivered by using SMSCaster E-Marketer.